The organized actions of the foot and ankle complex is often overlooked and misunderstood in the fitness industry. This adaptive lever plays a role in every upright action from human locomotion to squats and lunges. With the advancement of the fitness industry and expanding role of the fitness professional there is greater likelihood of encountering a client with foot pathology or foot compensations. To remain competitive among your colleagues and achieve the greatest results with your clients, it is imperative to gain an understanding of the role the foot and ankle play in creating and modifying fitness programs. 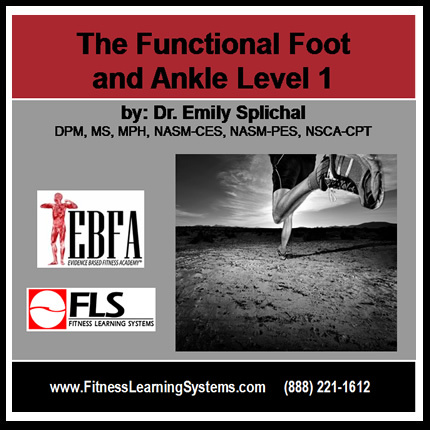 Understand the complexity of the foot and ankle and why this knowledge is important for the fitness professional. Learn the interconnection of the foot and ankle with the rest of the body’s kinetic chain. Review foot and ankle case studies in which you will be asked to identify foot type, analyze for dysfunction, and apply a corrective fitness program. Learn the anatomy of the foot and ankle including osseous anatomy, joints, and muscles. Identify general movement patterns for the body and specifically for the foot. Explain foot types and understand how they relate to movement and pathology. Practice a basic foot and ankle joint assessment. List pain conditions associated with the foot. Consider pathological conditions of the foot and ankle as related to training and function.